Which spectrometer entrance aperture should I use? In the case of compositional analysis for elemental distribution or quantification, the 5 mm aperture is better suited because it allows a bigger collection angle and more signal into the spectrometer. For chemical analysis, the 2.5 mm is better suited since it delivers a slightly higher energy resolution. Which camera length should I use? 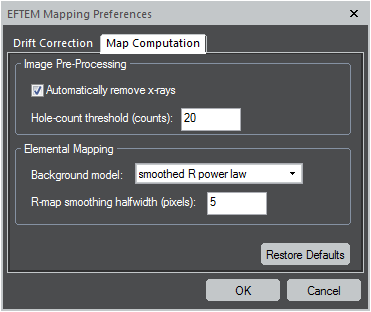 For general mapping, choose the shortest camera length available in the microscope. However, it really depends on the converge angle required. You always want to have your collection angle much bigger than the convergence angle; ideally two or three times. Why is the spectral acquisition rate slow? Use higher vertical binning in the camera setup. Ideally you want to run most of the experiments with the camera set with the highest vertical binning. Why is the low energy portion of my electron energy loss spectrum flat? The electron energy loss spectrum is probably saturated, since the low energy portion shows the highest number of counts. Reduce the exposure time or the binning. In my STEM EELS acquisition, the interfaces that were straight in the surveyimage are tilted or wavy. This is typically caused by specimen drift during the acquisition. 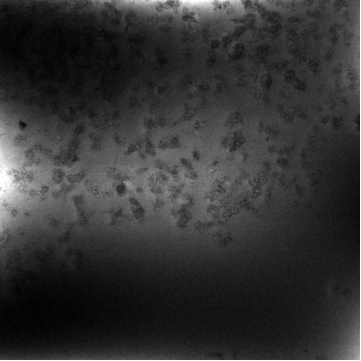 Wait to get the microscope more stable or use the spatial drift correction function. Why is the map that I acquired fuzzy or have poor resolution? Note: Both of these methods will reduce your image intensity. Increase the beam current or exposure time to compensate. Stigmate the image in normal phase contrast mode using the Diffractogram method if possible. Be sure to have the same objective aperture inserted while stigmating as it will be used for the EFTEM data acquisition. Focus the image at this energy loss. Look to optimize the sharpness of the features. You can condense the beam smaller than the field of view to get more current if needed. If you do, be sure to optimize the beam to just larger to image field of view before data acquisition. Why is the intensity of the EFTEM SI negative at high energy losses? Why does a strange shadow exist in the images and maps? This is caused by tuning of the Filter or an incorrectly centered zero-loss peak (ZLP). It is good practice to tune the filter (using the Tune for spectrum focus option in AutoFilter) at the magnification you will be using to acquire your maps. Do this at the early stage of the setup to avoid scintillator afterglow. Why does a semicircular shadow appear in a corner of my EFTEM SI (the shadow may shrink into a circle or drift across the image field of view)? This is typically caused by a poorly calibrated Condenser Adjustment. As the HT is changed to acquire the EFTEM SI, an automated adjustment must be made to the condenser focus and deflectors. To run this calibration, make sure the system is in Power User mode and run the menu item “EFTEM | Calibrate | Calibrate Condenser Adjustment …”. This is best done with a sample in the TEM and moderately thick area in the field of view (1 – 2 mean free paths). Simply follow the online prompts.